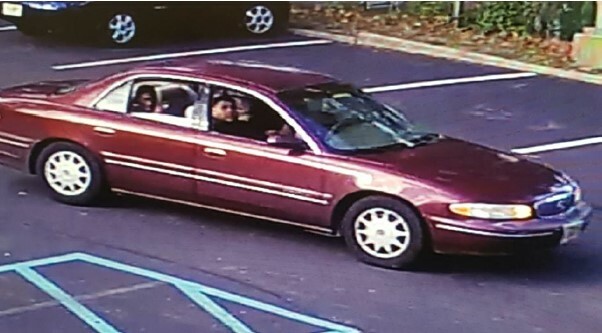 The Camden County Prosecutor’s Office and local authorities from Pennsauken Township Police are seeking the public’s assistance in identifying a vehicle that may be connected to a homicide Friday evening. 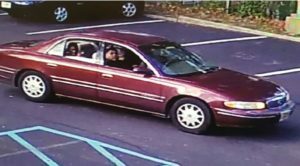 The vehicle is described as a burgundy or red 2000 Buick Century with stock rims, and is shown in the surveillance photo below. The vehicle depicted below was possibly used during a homicide that occurred September 8, 2017 at approximately 5:25 p.m. on the 7000 block of Stockton Avenue in Pennsauken Township. The suspects are described as a Hispanic male, approximately 5’ 9” tall, stocky build, the second is a thin black male approximately 20-30 years old. Members of the public should not approach the vehicle or attempt to apprehend these suspects, but should call 9-1-1 immediately. Camden County Prosecutor’s Office Detective Michael Rhoads at (856) 225-8561 or Pennsauken Detective Sergeant Warwick at (856) 488-0080. Released Monday, September 11, 2017.